This was a rather interesting project I took on. The project was created to monitor and restrict how many Remote Desktop sessions were permitted to logon based on configuration per-OrganizationalUnit (OU) in Active Directory. sessioncheck – the executable that needs to be set to run for each user login and logoff script on a RDS Host. 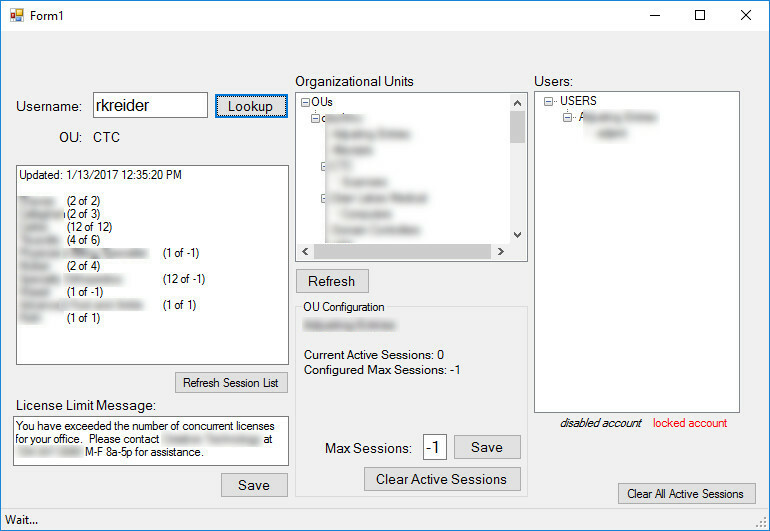 sessioncheck pops up a notification message box upon logon if there are no available slots left for “Max Sessions” and then logs the user immediately off the RDSH. sessioncheck and Userlock GUI utilize a MSSQL Express database to store session data and check configurations for Maximum limits. It works surprisingly well. If you might be interested in this project for use at your organization, there are some code changes I’d need to make for more portability outside my environment, but it’s doable. Get in touch with me.